John has now set up his own web site here where you can see pictures of his models (some not featured here), plus construction notes and photos. Highly recommended! This is a 16" span Dime Scale Messerschmitt Bf109 from an old Comet design. 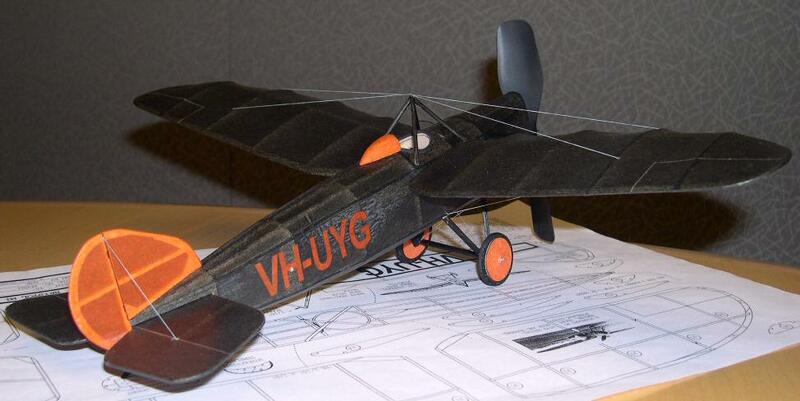 John built the model from a "Scale Model Flight Co." kit, (available from Penn Valley Hobby Supplies ). The airframe weight (minus prop) is a commendably low 8.4 grams. This design is a good performer amd has proved successful in Flying Aces Dime Scale competitions. The Junkers D-9 was enlarged to 16" span from a Pres Bruning p'nut plan. This went together real nicely. The corrugated metal was simulated by rubbing a gray colored pencil over the tissue which was laying on a board of uncooked spaghetti noodles glued side by side (!) The model is in the shop for repairs right now. On its trimming flights, the landing gear snapped off because the wing ribs at the landing gear attachment point weren't made from solid balsa - the centers of the (very thick airfoil) ribs were cut out to save weight. "Live and learn" says John, as the whole center section of the wing and landing gear must now be rebuilt. 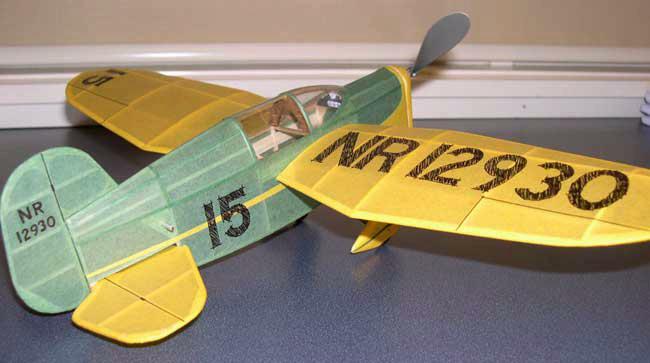 Moving to peanut scale models now - this Fairchild PT-19 is built from a Gene Dubois kit. John reckons it is a bit on the heavy side so he's scraped the prop until it is almost see-through and even removed the landing gear, which seems to have helped. The model is still being trimmed, but right now its flying in large left hand circles for about 15-20 sec, but there is more to come. 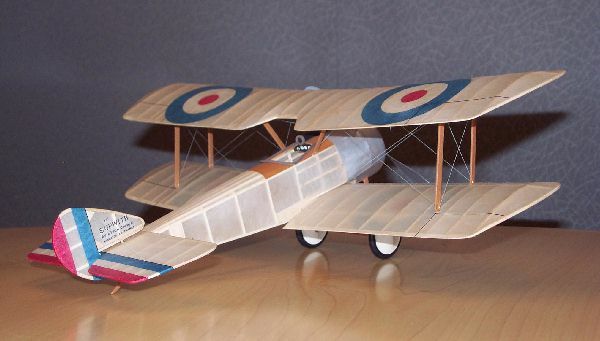 This is a Farman Moustique, built right from the box. It's a Micro-X peanut kit. This is pretty light and is primarily an indoor flyer. It flew right out of the box with a slight amount of right thrust. It is consistently turning in 45 sec flights on a loop of 3/32 rubber. 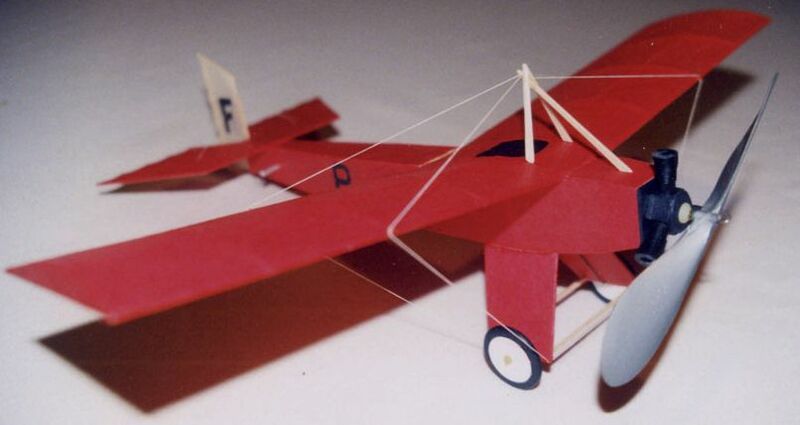 This Comet 16" span "Mr. Mulligan" is built from the Scale Model Flight Co. kit. weight without rubber is a creditable 14 grams. 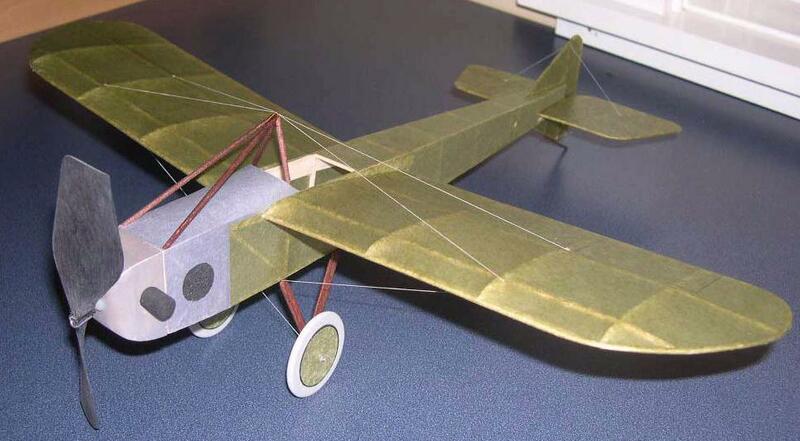 The model is slightly nose-heavy due to a styofoam cup being used for the cowling instead of the suggested paper wrap - probably a sensible move, as it gives you something more substantial to hold onto when winding the model. The model has proved to be an excellent performer, giving consistent flights of 45 to 50 seconds outdoors. 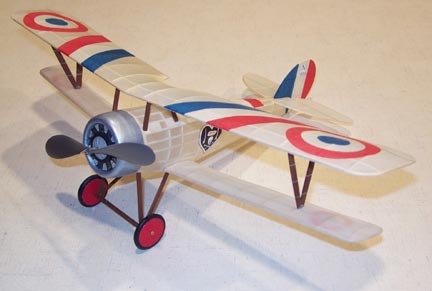 This model of the very pretty Velie Monocoupe was built from the Dave Deadman plan that came with the May/June 2001 issue of "Flying Scale Models" magazine Weight is just 19.5 grams. "I scanned in the logos and numbers from the plan, then cleaned them up in Adboe Photoshop. Printed them out at the right size on xerox paper, used a black crayon to color the edges of the paper (magic marker bleeds into the white parts of the logo - guess how I found that out? ), and used a gluestick to adhere the markings to the tissue". 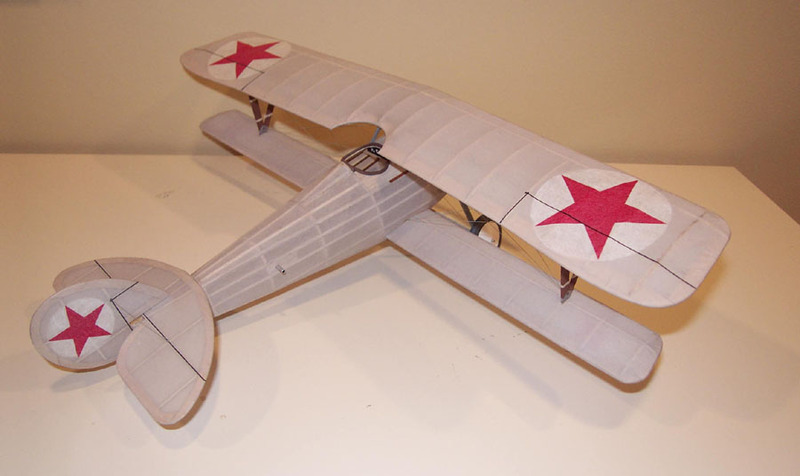 This is John's much lightened 18" span Guillow's Nieuport 24/27, based on the original kit plans. The weight is 19.6 grams without the prop. This has been achieved with extensive lightening of the kit structure, including laminated balsa outlines for the wongtips and tail feathers. Finish is all-tissue, loosely based on a Nungesser N.17. Some preliminary flights have been timed at 20-25 secs with an 8" loop of 1/8" rubber at about 750 winds. John will try increasing the loop length and thickness - maybe up to 3/16". 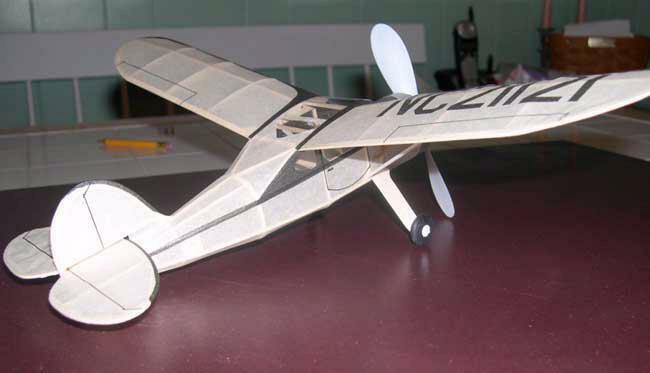 Another Dime Scale model from John - this time a Wiley Post Model A. 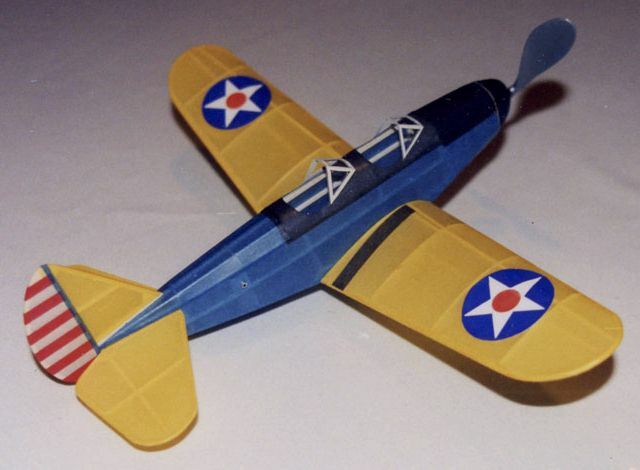 The design is a pre-war Comet kit with 16" span, - this one has been re-kitted by Scale Model Flight Co. and is available from Penn Valley Hobby Supplies. The model is very light, at just 11.35 grams including prop (but no rubber) so should be a good performer. The fuselage stripe is just yellow tissue. An oversized piece of yellow tissue was covered with gluestick. After it was dry - very dry - the stripe was cut out and laid in place on the fuselage. The stripe was adhered by using a trim iron and softening the glue. 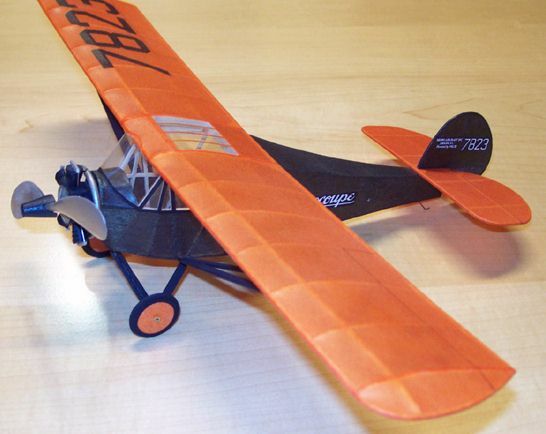 This very clean Fokker D.VII is built from the Golden Age Reproductions 18" span kit, which is an old Peerless design. 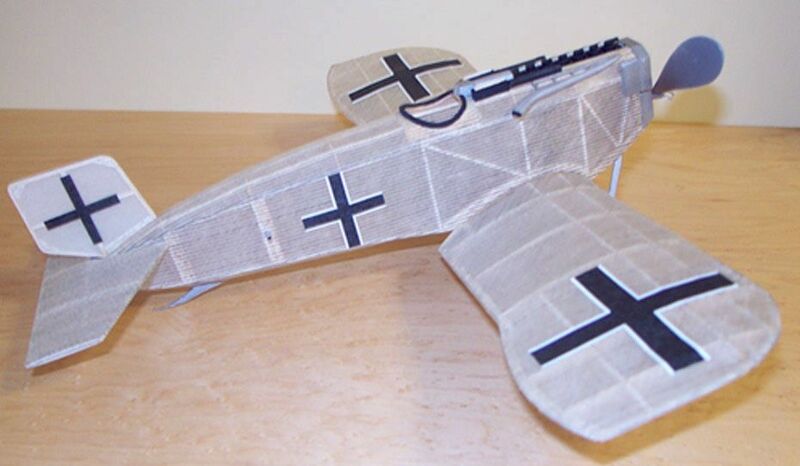 The aircraft is finished as Goering's famous all-white machine. This model flew very well "off the board", with flights of around 40 seconds achieved straight away. John reckons there is more to come. 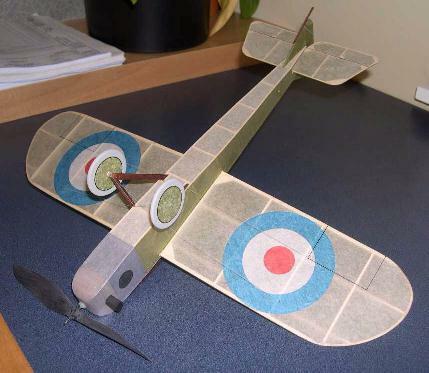 This is the DPC Models kit of the Sopwith Pup with a few modifications. These include laminated wing tips, balsa cowl and sheeting (instead of plastic and bond paper), wing spar moved to upper wing rib surface, and no wing riblets to save weight. Markings are all tissue paper. Clear doped linen color is Micro- X "Old World" japanese tissue. The weight is 23 gms without prop and rudder, 28 gms with prop. 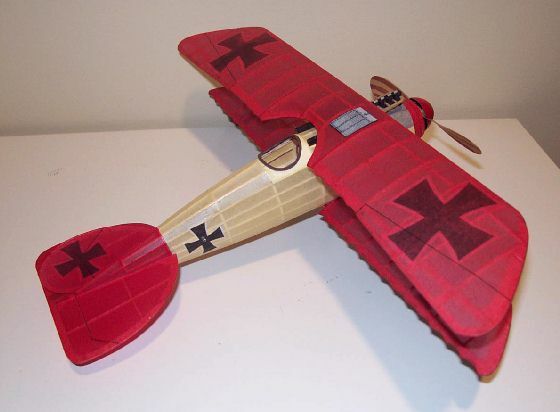 Another DPC kit - this time an Albatros D.V. Span is 17.5" and weight 25.5 grams with prop. Very neat and colourful tissue finish - model not yet flown but it looks like it should go rather well. 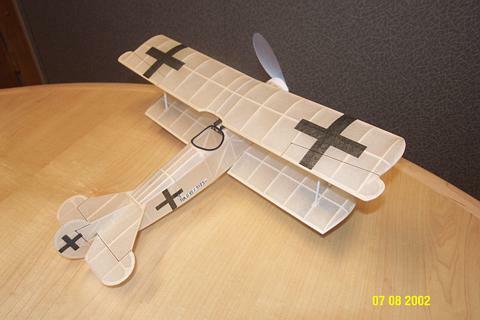 John has really got a taste for these DPC Laser cut kits - here is very nice Nieuport 24. It was built for a review in the magazine "FLYING MODELS". The span is 18". The markings are done with grey chalk on tissue, red tissue for the stars, and white colored pencil to highlight the circles. The scheme is 1917 Japanese. Rigging is elastic thread. 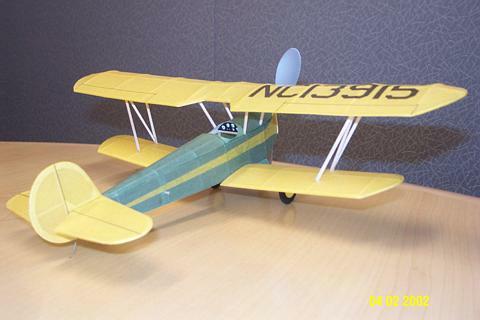 This is a "neo-dime scale" plane built from plans by Derek Buckmaster for the Bristol M1-C Racer. The span is 16", and it has given John many fits trying to get it trimmed. The weight is just under 13 gms without rubber. The color scheme is fictitious. The original racer was apparently red with white or silver markings. The colors are all done with tissue, the markings are orange tissue applied wth spray adhesive, the control surface lines are silver ink pen, and the rigging is elastic thread. 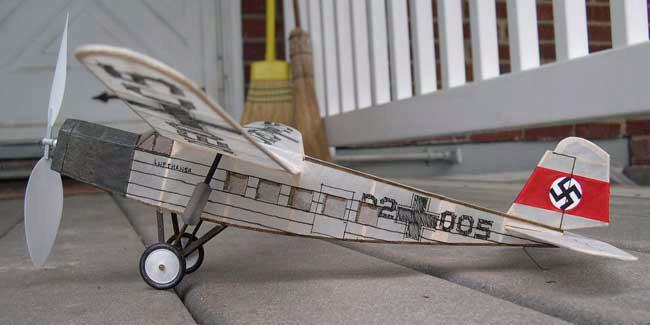 Regular visitors will know John has already built a Dime Scale BAT monoplane from the Al Backstrom plan. It flew so well, that he felt he should build another. This one John decided to do in RFC colors instead of the fictitious Italian scheme of the earlier one. Instead of Japanese tissue, he used domestic, and the quality differene was very noticeable. The Domestic tissue is much heavier and harder to work with when wet. The weight is 14.2 gms w/o rubber. After trimming this plane to fly in very promising LH circles, it landed in a tree and was destroyed when trying to retrieve it. Another one may be on the cards! This is definitely not a typical John Ernst model. I mean, it has scale rib spacing, and loads of little riblets! 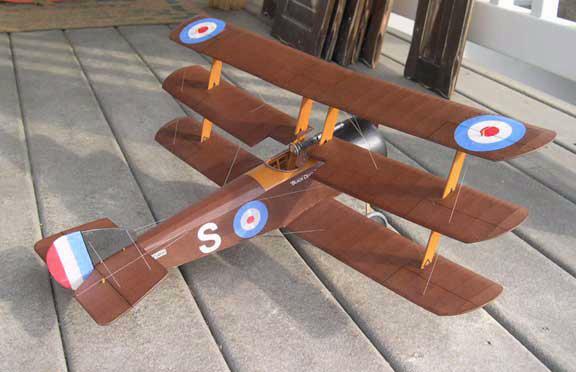 It is the 22" span AeroGraphics Sopwith Triplane kit. John built this for a review in Flying Models magazine. It's electric powered - HiLine mini6 - his first one. The tissue is japanese dyed brown, and "antique" for the clear doped linen undersides. All roundel markings are tissue, and "cut" into the field tissue and attached with gluestick. The Cowl is attached with 1/8" dia. magnets to allow access to the motor. Finished weight is about 50 gms. This is the Scale Flight Model Co. (Penn Valley Hobby Center) reproduction of the old Comet Winnie Mae Dime Scale kit. The span is 16", weight is about 12 gms without rubber. Obviously, this color scheme is not done as Winnie Mae. The tissue is japanese preshrunk until it is wrinkled like alligator skin, ironed, then attached to the frame. In theory, it will eliminate any warping due to tissue shrinkage. Markings are silver tissue cut-out attached with glue stick and secures in place with a trim iron. 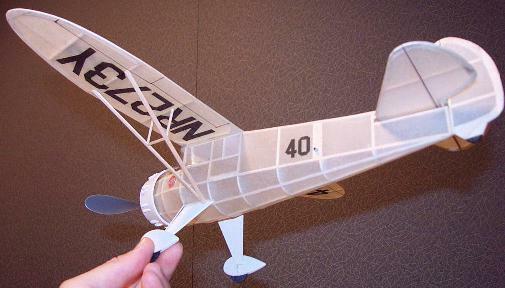 This is the 15" Easy-Built Dime Scale kit of the Luscombe Phantom. This also was provided to John for review. This weighs about 12.5 grams without rubber motor. Covering is white japanese tissue with black tissue markings. simple and very effective. This is the 16" span version of the Comet kit of Art Chester's "Jeep" Racer built from scratch. This one weighs in the 12 gm range also. The covering is japanese tissue, and the black markings are drawn on to the tissue by hand before covering. A new technique tried by John, to give the plans a 'comic book' or relaxed style. 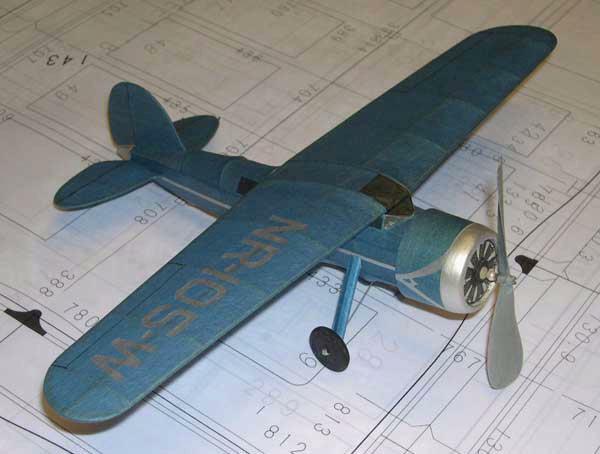 This Meserschmitt M20b is a scratch built 18" span version of Mike Nassise's 20" plans. It's considered Dime Scale. 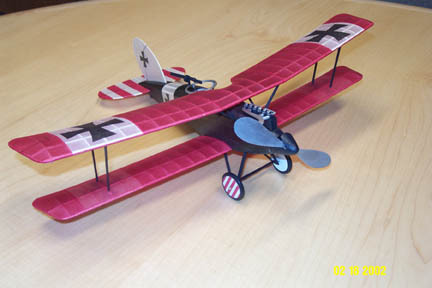 John chose chose a scheme that represents a late 1930's Luftwaffe version. The tissue was washed with a silver colored pencil, then all markinngs were drawn onto the tissue by hand with a black ink pen. The red band on the rudder is tissue. Prop is 6" IKARA. Weight is about 18 gms.